Thank you for your interest in our film and for signing up to empower teenage girls to be local agents of change. By hosting a screening of MAINE GIRLS, you're bringing a powerful conversation about immigration, equity, discrimination, and hope from South Portland, Maine directly to your community—and in some instances, into your own neighborhood! We can't thank you enough for your leadership, courage, and commitment to ensuring that America is a welcoming place for all to call home. Hosting a screening is both easy and satisfying. We've broken it down into steps and provided additional resources below and if you need to reach our team, you can contact us at info@mainegirlsfilm.com. Screenings can be held for smaller groups in a private home, or at larger venues, including a library, school campus, or place of worship. Your screening can be personalized and adapted for a range of different audiences as well, including students, educators, and parents. Start by informing the MAINE GIRLS impact campaign team of your screening date so that they can support you along the way. You can reach us at info@mainegirlsfilm.com. Once you have your date locked, MAINE GIRLS will schedule a call with you to help you establish your goals for the event. 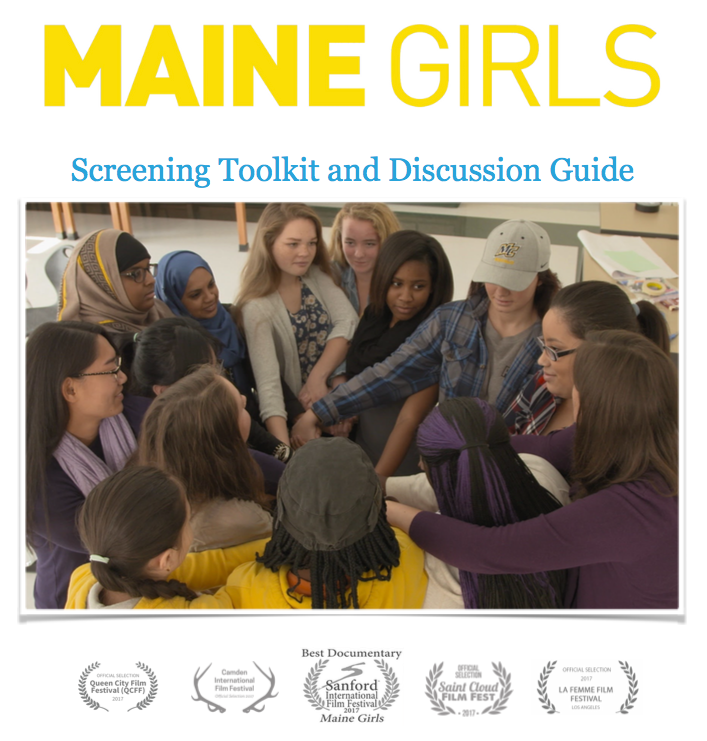 Prior to your call, DOWNLOAD THE MAINE GIRLS SCREENING TOOLKIT AND DISCUSSION GUIDE by clicking here. This Screening Toolkit and Discussion Guide includes tips for organizing, promoting, and facilitating a screening that will spark productive dialogue about immigration, discrimination, and inclusivity. It also provides helpful resources and actions, suggested discussion questions, and actions that your screening guests can take to further social impact and make lasting change. Aim to bring together a group of people who you feel would be comfortable discussing the film and who are open to new ideas and new people, but reach outside of your immediate circle. Don’t just invite people who look and live like you. Invite as many individuals as can fit comfortably in your viewing space. This could be a small group of 4 to 6 people in your living room, a group of 25 in a conference room at work, or 50 people in a church basement, or 200 people in an auditorium. Get creative! Once you’ve invited guests, continue to promote your event across social media and ask allies in your community to help you spread the word too. Social media: Here are some sample social media messages that you can use to create your own Facebook, Instagram, and Twitter content. Be sure to link to your event registration page and promote the time and date. On the ground: Here’s a MAINE GIRLS poster image that you can download, add the details of your screening event to, and pin to bulletin boards and hang in other places where your target audience frequents. You can also download our postcard files here and print them to distribute before and during your screening event. Start on time: Aim to begin no later than ten minutes from the posted time. This will give latecomers an opportunity to join the group without delaying the screening. Acknowledgements: Begin by thanking people for coming and acknowledging any volunteers. To introduce the film, you might begin by sharing why you decided to host an event on this topic.If you are facilitating a panel discussion following the screening of the film, remind guests to stay for the conversation afterwards. Spur Discussion: Facilitate deeper dialogue after viewing the film. Focus on your established goals and desired outcomes for the screening. We’ve included some sample discussion questions in the Screening Toolkit and Discussion Guide to help you prepare, but make this your own. Prepare questions for the audience designed to foster conversation about the specific issues the films brings up that are relevant to your community. Spur Action: Following the discussion, invite your audience to take action— that’s the main reason you signed up to host! Your commitment to making a difference will start with raising awareness through the film and deepening understanding through the discussion, but to ensure lasting change, your guests will need to take action. Closing Remarks: Close the program with a quick recap of what was discussed and a few positive words. Emphasize that at the end of the day, we all have a responsibility to build bridges in our communities. It starts with simple everyday actions and behaviors that foster understanding, nurture empathy, and develop trust. These can be as simple as smiling and saying hello to someone you’ve never met to volunteering to help immigrant families adjust to their new life in the U.S. Thank any volunteers for helping and attendees for coming. Discuss: Remind attendees to share about the film, specifically, what they learned with friends and colleagues. Host a Screening: Encourage guests to follow suit and host a screening of their own! They can become a screening host by signing up at MaineGirlsFilm.com/host-screening or emailing our campaign at info@mainegirlsfilm.com to learn more, set a date, and receive a copy of the film. Act Locally: Ask guests to talk to school administrators about bringing the film to their school and encourage them to implement the U.S. Teen Slim Peace program as well. Email info@mainegirlsfilm.com to learn more and start the process.